Students from the Hebrew University have developed socks that contain pressure sensors connected to a mobile phone app, by means of which they issue warning on a pressure capable of causing foot ulcers in diabetes patients. The development is intended to help patients suffering from diabetic neuropathy caused by nerve damage as a result of anatomical distortion, excessive pressure or insufficient blood supply. The disease blurs the feet sensitivity, and the patients do not feel pain or pressure that may lead to foot ulcers, pressure ulcers and even to amputation. Over 130 million people worldwide suffer from diabetic neuropathy, which is a major cause of limbs amputation. Diabetics undergo regular examinations to monitor the increased pressure in the legs and to detect ulcers. Since such ulcers are diagnosed only after they develop, recovery time is required that significantly increases the patients’ suffering and the cost of treatment and recovery. The newly developed sock contains dozens pressure sensors hidden in the sock’s cloth. 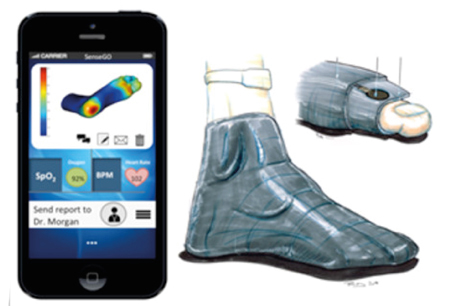 The sock detects the pressure generated by incorrect posture, anatomical distortion or poorly fitting shoes, and sends signals that appear in the app on the smartphone and warn about the ulcer risk. The sock is also suitable for cleaning in a washing machine.